By Mustang JBB, October 20, 2015 in Get to da CHOPPAH! I am going to try to build a 1/32 Revell UH-1D for this group build. I have the most recent release of the kit and I ordered some Archer Rivet Decals. I intend to build it mostly OOB except for a few parts that are easy to build and obviously missing from the kit. 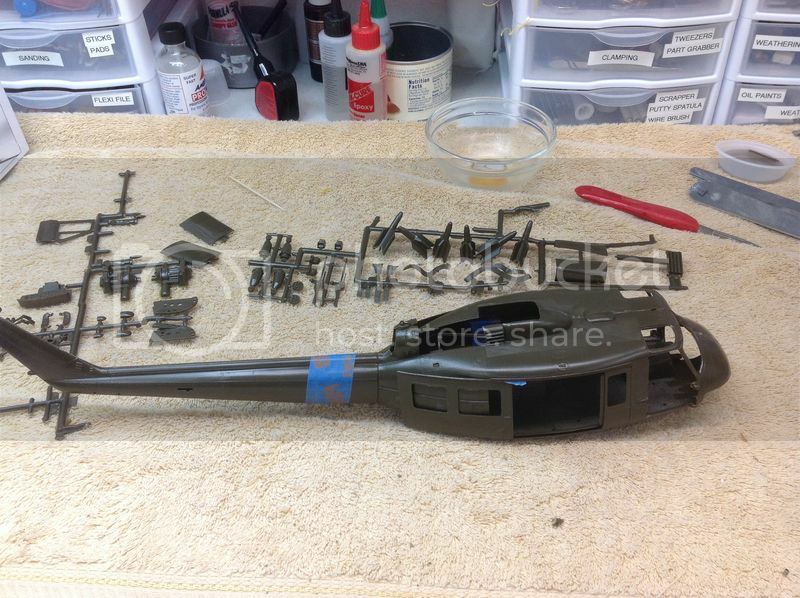 Some parts of the rotor head will be replaced by aluminum/brass wire or tube for strength only. Not going to scribe it it, but I know I will sand away a bunch of rivets. The old kit just doesn't fit that well. I have been wanting to build one of these for a while, mainly for nostalgia purposes. Can't tell you how many of these I built as a kid. My big issue will be time. I work on the road and can't carry all my modeling supplies with me. I can sand and prep parts, but no painting or large assembly. Lighting is also an issue. Hopefully during the Thanksgiving and Christmas Holidays I can knock this one out. Not sure if I want to build it as a gunship or slick. Armament pieces are kind of crude, but to build a slick, I need to scratch some seat benches. Might do some simple benches and close the side doors. All the windows are not that clear anyway. 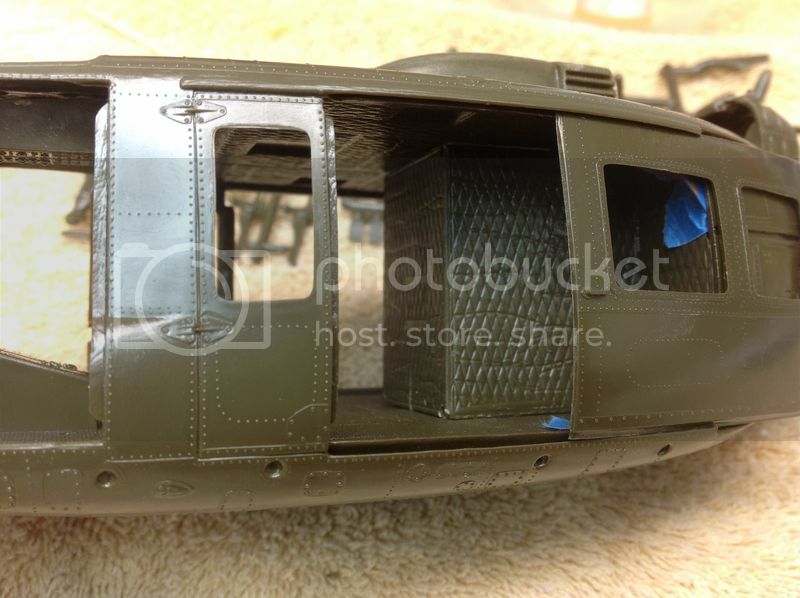 you've got yourself a very nice project for the helo GB, and despite your limited time, i think you'll pull it through, take your time (no pun intended...) and most importantly have fun building. Since it is rainy down here in San Antonio this weekend, I found some time to play with this beast while home. It's going to be a lot of work just to clean up the flash and connection points from the sprues. Many parts had broken loose in shipment and made ugly nubs to clean up. I know this mold is old, but I am amazed at the number of tool marks. Sadly there is evidence of corrosion or rusting of the mold in some spots. Tiny spots, but still there. I would like to compare and old molding of this kit to this one, to see what has changed over the years. Enough whining. The kit still has a lot of good detail and fits surprisingly well. 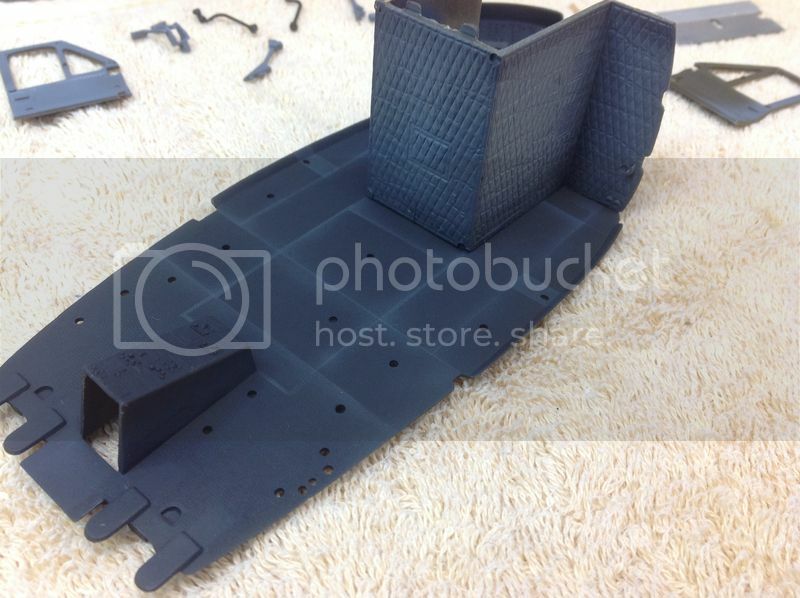 I can see several places where I will have to sand away raised rivets and a few panel lines. The rivets should be easy enough to replace with the Archer products, but I won't bother trying to fix the panel lines. I will just sand them back to some intersection so they don't appear to fade away into thin air. I will try to fix the tools marks and mold flaws that are in areas that won't risk surface detail. This is a nostalgia build, not competition build, so it's going to be about fun. I will concetrate on the paint job and weathering, not detail. I sure hope I can get her finished before the end of this group build. Thanks for looking. this sounds like a great little project. Hope it is going good with this GB.. Unfortunately I have only been able to do a little parts clean up so far. But this weekend I will be home and might get some of the cockpit painted. I also intend to bring the kit and some tools on the road so I can get all the parts prepped for paint or assembly. 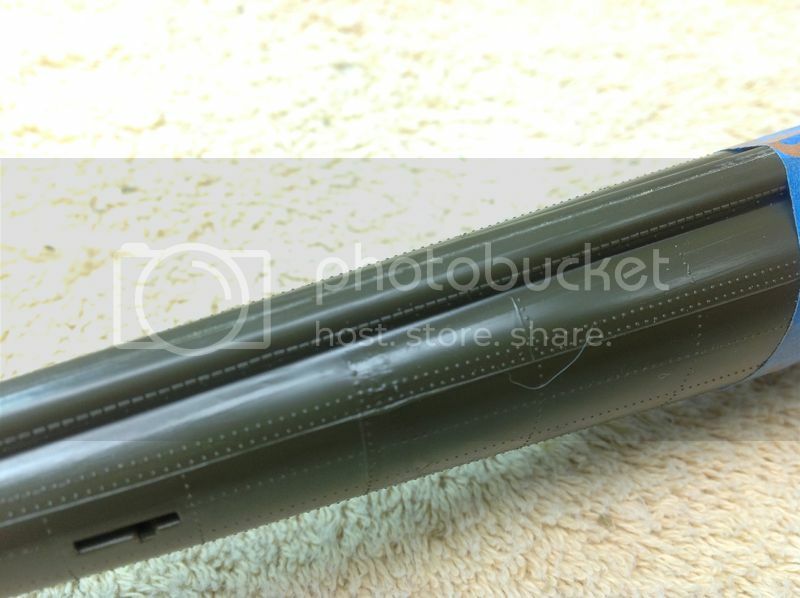 My Archer rivets are waiting at the hobby shop, so I will be able to play with those. they say Archer Rivets are good ...hope they live up to their expectations. My apologies guys. On the drive home I started feeling bad. Turns out I have strep throat. Yeah! Spent all weekend in bed. No work on the Huey at all. hope you feel better soon,. your health is more important so get well soon and take it easy. So actually got some paint on this beast. Not much, but it is a start. There is an excessive amount of flash on this kit. 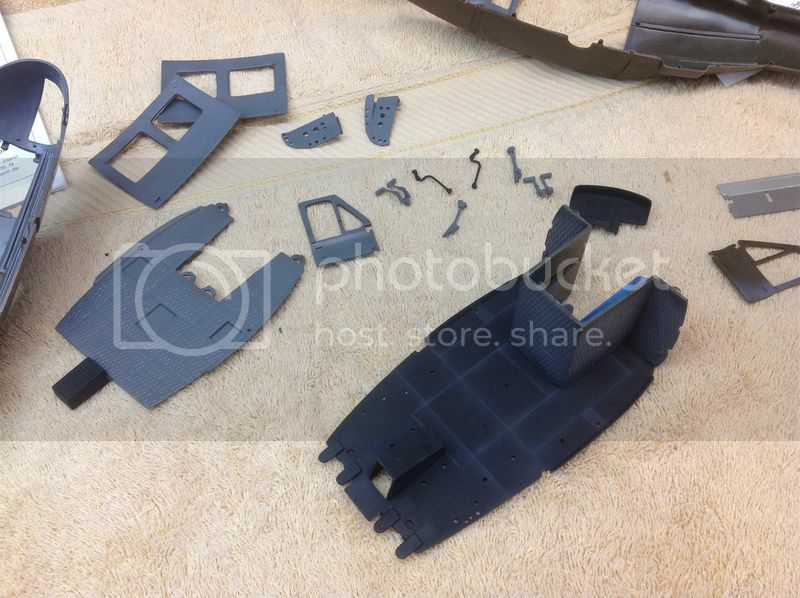 Every part has to be scraped and sanded to get rid of mold lines and flash. I know the mold is old, but this is kind of ridiculous. Oh well! Modeling is bout patience and persistence sometimes. This is also a background build, more for fun and nostalgia than anything else. I have other "serious projests" going on at the same time, so this one will get attention when I can get to it. hope the throat is better . keep that Texan tenacity going..
you are doing a fine job and I am enjoying seeing these Helicopter GB.. a lovely change of scenery from time to time..thanks for a good thread. How are you feeling.Getting better I hope. Hope you're well .feeling better.